Who? 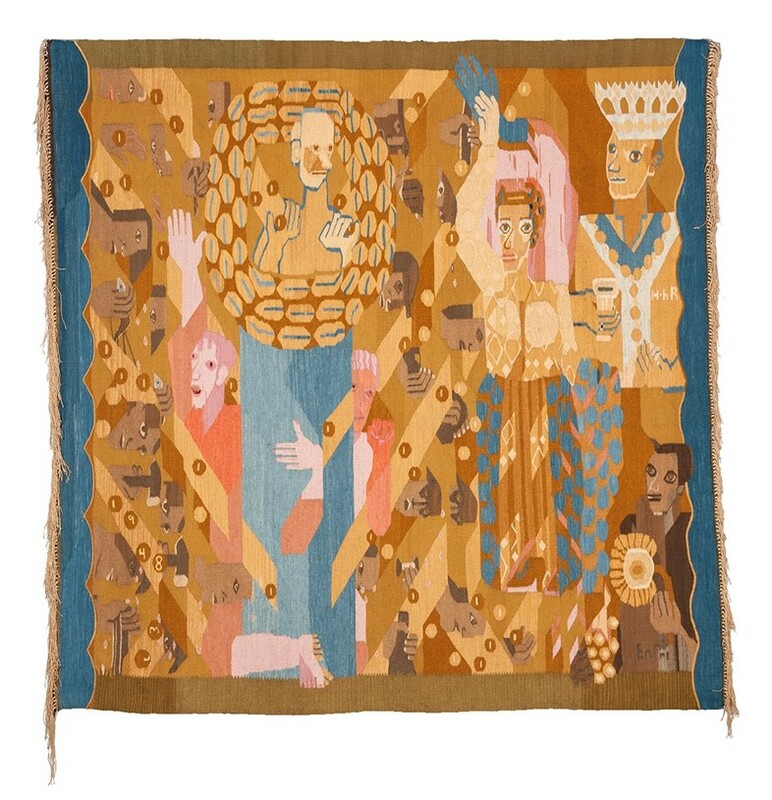 At first, it’s the gorgeous colour of Hannah Ryggen’s tapestries that draws the eye. Those private pinks, indigo blues and browns that bring to mind the soft backside of a Jersey cow – shades obtained from plants, bark, lichen (and the urine of local men!) near her home in Trondheimsfjord, Norway. But it’s the sight of Hitler farting oak leaves, or a decapitated Mussolini that really pulls one in for a closer look. Born in Malmo, Sweden in 1894, Ryggen is less well known outside of Scandinavia than she ought to be. Originally a painter, she swapped her practice for weaving politically searing murals that responded to the socio-economic issues of the day, from the rise of Fascism in the 1930s and 40s to the Vietnam War. Ryggen lived remotely – she and her husband Hans were subsistence farmers, living and working without running water or electricity – but staying connected to the news of the day was essential to her work and interests. A faithful subscription to Norway’s Dagbladet newspaper for over 30 years provided the inspiration for her woven scenes. What? A lifelong Communist, Ryggen didn’t like to sell her work to private collectors. She believed, like Picasso, that “painting is not done to decorate apartments. It is an instrument of war.” Instead, her tapestries were positioned in public and governmental buildings, where as many eyes could fall upon them as possible. Unlike unwieldy canvases, her sharply-observed works could be easily rolled, transported and shared with the masses – much like a newspaper, in fact. Throughout her life Ryggen created over 100 large-scale works, and in 1964 she was the first woman artist to represent Norway at the Venice Biennale. Clearly, Ryggen was not an artist of the cosmopolitan urban-dwelling variety. She had, according to art historian Marit Paasche, “first-hand experience with poverty and indebtedness.” Not only did the livestock she an her husband raised provide wool for her to work with, it also allowed them to continue eating during periods of financial scarcity. The importance of providing for themselves is shown in We and our animals, a warm domestic narrative scene in ochre showing Ryggen’s family living alongside hens, cows and horses – their kitchen table plentiful with a simple roasted chicken. Why? Who hasn’t folded a daily newspaper, or exited a tab in despair after reading its contents? Hannah Ryggen’s tapestries are a timely reminder that art is exactly where such anguish can be channelled, without a need to find the words. With each turn of her loom, Ryggen called out politicians, dictators, and the divide between the wealthy and the poor. Indeed her 1966 piece Blood in the Grass was born out of frustration about how media coverage would fixate on the small, everyday quips and actions of the US president (in this case, Lyndon B. Johnson picking up a beagle dog by its ears during a photocall) in favour of urgent news stories (like the Vietnam War) – clearly something today’s news organisations could be more mindful of. We’re also left inspired by a woman whose craft was completely self-taught. 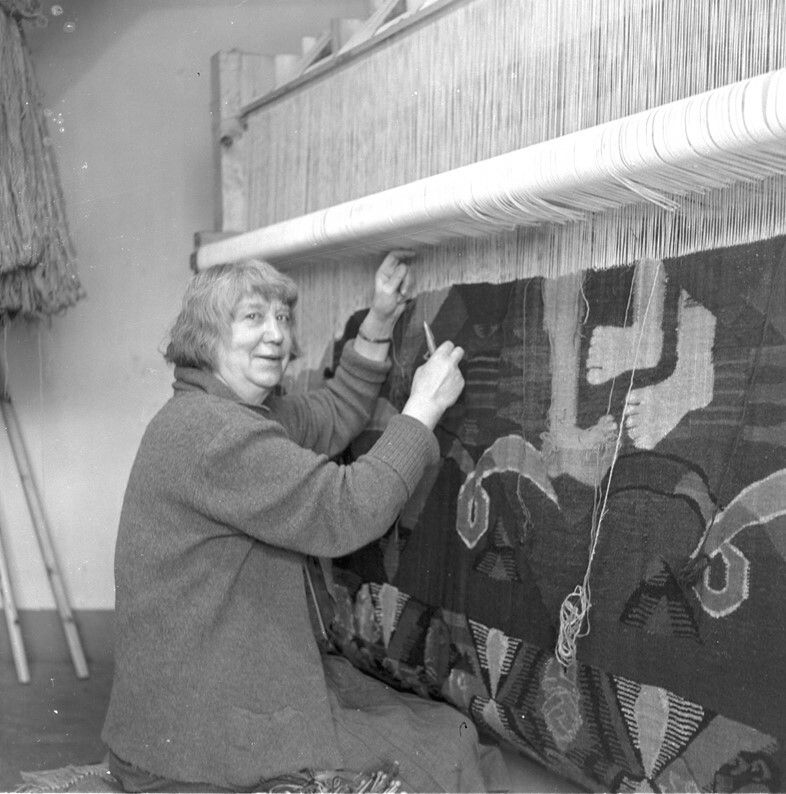 In many ways her approach was audacious – unlike trained weavers who sketched and planned works in advance, Ryggen worked directly with the loom. “I always weave in a certain rhythm from beginning to end,” she wrote in 1946. “I prefer to collect myself and then let loose with explosive effect.” You can see it in her tapestries, on display now at Modern Art Oxford; a reminder, if you will, to quietly try to feel your way through, beyond trial and error to a dazzling conclusion. Hannah Ryggen: Woven Histories runs at Modern Art Oxford until February 18, 2018.